hours every day as possible by this means the leaves will become sufficiently soft in about 12 or 14 days then put each leaf in another Pan of Water a little warmed & pulling them gently between the thumb & fingers, the Skin of the leaf will on each side become loosened, and may be easily taken off then lay the leaf gently upon a Glass or plate till dry - Pickle for Beef Mrs Vane Take four Gallons of Water and nine pound of common Salt half a pound of Bay Salt a pound of Sal petre one pound of brown Sugar mix these all well together, and let them boil in the Water about an hour, scum it well. 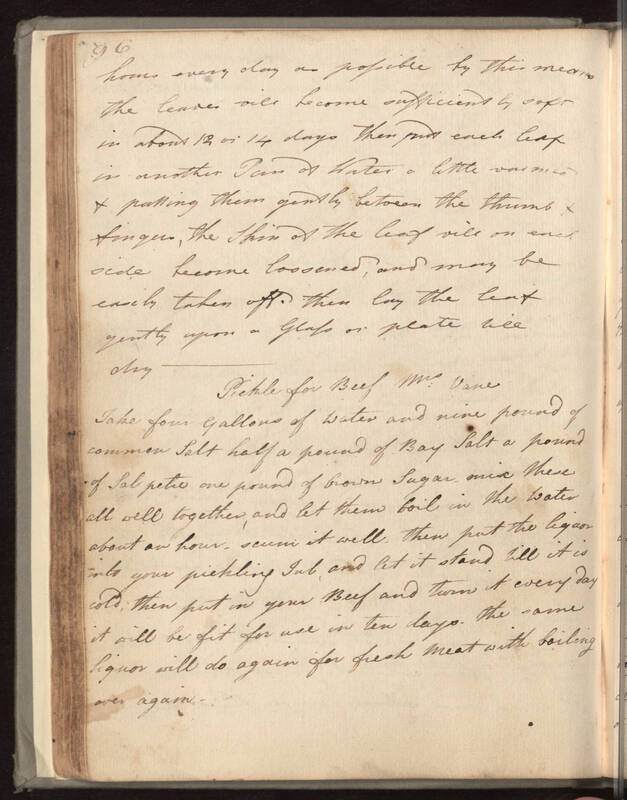 then put the liquor into your pickling Tub, and let it stand till it is cold; then put in your Beef and turn it every day it will be fit for use in ten days. the same liquor will do again for fresh meat with boiling over again.